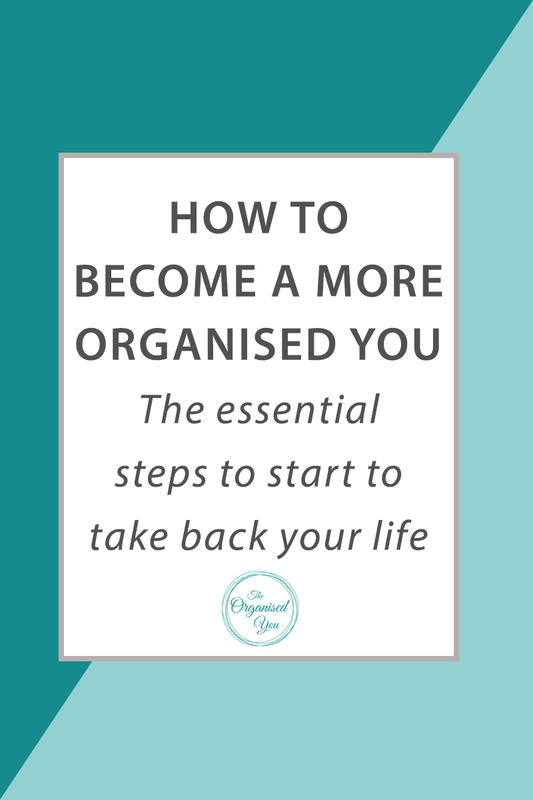 How to become a more 'Organised You' - the essential steps to start to take back your life! Do you want to become a more organised person? Sometimes starting the whole process can be overwhelming, and it's difficult to know where to begin. Being organised isn't something that magically just happens, it is a skill you need to continually work at. I am always making lists, pre-preparing, doing weekly/monthly/yearly decluttering sessions.... it's definitely an ongoing process. If you're just starting out on the road to organisation, good for you! The first step is recognising a need for change and wanting to do something about it, so you've already won half the battle. You will definitely be feeling more in control, calmer and happier as you become more and more organised. Here are the first steps you can take on the journey to becoming a more 'Organised You'. If you're wanting to get your whole house organised, it could be difficult to know exactly where to start. Talking it over with your partner/ housemate/ family members is a good idea so they can help you identify what they believe the problem areas are. Their areas of frustration may be different to yours. Perhaps it's lack of meal planning which makes every evening in your house stressful and rushed. Maybe you need a better system for your laundry so you can feel more on top of it. Your kids may be frustrated because they keep misplacing important school info in the paper pile, or can never find the right lego pieces. This doesn't mean you're going to be spending a month organising lego! But it can be an eye-opening experience to hear what areas of the home are frustrating your family members, as you may never have considered them a problem. Write everything down during this brainstorming process. It's beneficial to now physically walk through each room of your house to record what any things that are really bothering you about each space. If you just write down 'organise the garage', it'll be hard to know where to begin! At the top of the page, record the room name e.g. kitchen. Start a new page for each different area of the home. Below the title, list all of the things that are bothering you, or that you need to organise. For example, in the home office, it could be the paper piles, lack of filing system, or the stationary jumble that are bothering you. In the kitchen, you might need to clear out the pantry, get better storage containers, and organise the pots and pans cupboard. Whatever is bothering you, or that you came up in your brainstorming session with your family members, write it all down. This list will probably leave you feeling very overwhelmed, especially if there are lots of areas in your house that are disorganised. That's ok - you don't need to do everything at once! Just decide on the area that is really bothering you as your starting point. For me, the kitchen is the number one place I want to be organised, so I can feel in control of meal planning, cooking meals, and making lunches and snacks for my kids. Choose your number one priority to tackle first. You will then number the master lists that you just created e.g. kitchen 1, home office 2, wardrobe 3, toys 4. This will give you a direction in which to head. And there is nothing more satisfying than crossing jobs off a list and throwing out that completed list! It is really important while you are thinking about all of this, to also think about what is preventing you from having/keeping that space organised. For example, if your kids' toys are disorganised, the main challenges could be that the kids don't help out in keeping things in their place, or you don't have proper systems in place, or you're lacking storage space. Consider how you will overcome these challenges. It's great to start the organising process, but how will you and your family keep it going? How will you (and they) maintain the new systems? - What is your vision for the space? - Do you need to buy any organising products e.g. containers, jars, storage boxes, labels? - What is your budget for this organising project? - Where will you do this project i.e. do you have space to spread everything out while you're decluttering? - Will you need help with this project in the decision-making process? If so, who will be helping you? It's important to think through each of these steps carefully, otherwise you may be all motivated to launch in, then find halfway through that you don't have what you need, feel discouraged and quit. That is definitely not the outcome we want! Choosing the right time to organise is a really important step - you need to actually schedule it in. It is unrealistic to think you'll be able to organise the whole house in 2 weeks. It is also unrealistic to think you can just do everything in the evenings after work, you'll exhaust yourself and resent the whole process. Think of the mindless tasks you will be able to do on the couch in front of the tv (if that's what you like to do in the evening! ), such as sorting through paperwork or your makeup collection. Something like a garage sort or wardrobe declutter will need more dedicated time and possibly a helping hand. So, those are the first steps in starting the organising journey. How are you feeling after reading through this? Excited? Overwhelmed? Stressed out?